Charming anthropomorphic characters, humorous mishaps, and outside threats add to the drama. Delicate pencil illustrations reinforce Heartwood’s cozy home theme. A sequel, The Greatest Gift, publishes simultaneously. A plucky mouse finds her true home in this warm, winning tale. This is a really sweet book about friendship, courage and community. The reader will become involved with the characters challenges, pasts, and how they overcome issues with the other animals at the hotel. A cute woodland story about friendship, courage, overcoming challenges, and the true meaning of home. 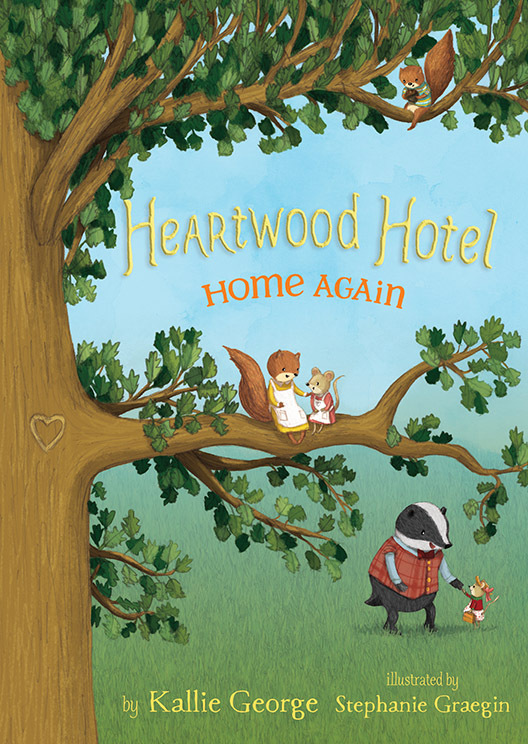 Heartwood Hotel is an enjoyable read that takes readers into the heart of the woods, and introduces them to a variety of woodland animal (and a few insect characters too). With Graegin's illustrations (I love this cover), and George's storytelling, this story is one that will make you wish you could spend longer than the time it takes to read this book, with Mona and her woodland friends. Heartwood Hotel is a charming, enchanting woodland story. This is a great book to pick up for kids that are reading chapter books. It also makes for a great read aloud. We're looking forward to reading the next book in this adorable series. I can’t wait to tell you about the CUTEST new chapter book series! My two older girls and I all read the first two books in the Heartwood Hotel series by Kallie George and these books are ADORABLE. These two books brought back so many happy memories of reading Old Mother West Wind, The Wind in the Willows, and writing my own stories. In all honesty, I fell hard in love with this series. These are happy, feel-good books that warm you from the inside out. The best part is that after she finished reading the books, I “borrowed” it from her and read them myself. We’ve been discussing the characters and how cute the stories are. Now, my nine-year-old says she needs to read them too. Heartwood Hotel, with the secret entrance hidden in a tree, a place of refuge for lost creatures of the wilderness, those that are easy prey for larger beasts of the woods. What an absolutely delightful little story, it reminded me of The Wind in the Willows and Mrs. Frisby and the Rats of Nimh. The Heartwood Hotel series is comprised of adorable, cute early chapter books geared for ages 7-10 with it’s easy reading and visual penciled pictures along the way. Youngsters can read and engage themselves in this series as they follow Mona through her family tragedy and the hunt to find another home and friends and acceptance. In this series, there are a lot of life lessons of acceptance that young readers will capture along the way. 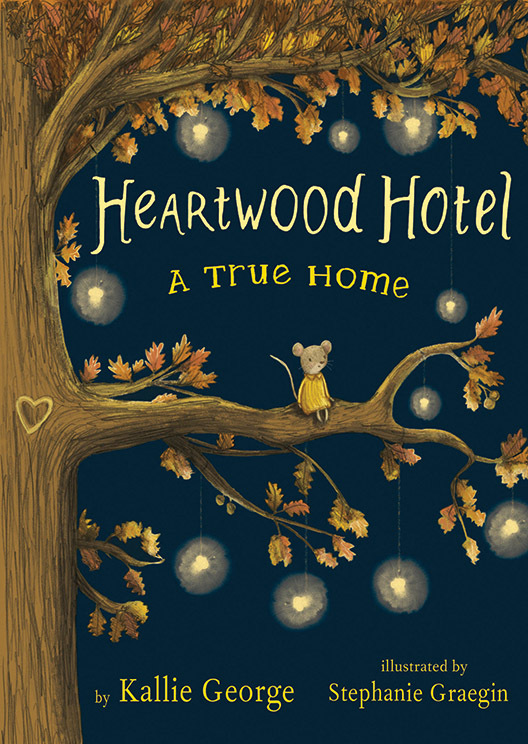 The Heartwood Hotel’s motto is: “We Live by Protect and Respect, Not by Tooth and Claw”, which the author thinks applies beyond the great tree’s rooms and will resonate with young readers and I agree! I can easily see my 7-year old son enjoying this series if he reads by himself or if it’s a book we read nightly together. Either way, it will keep his interest. 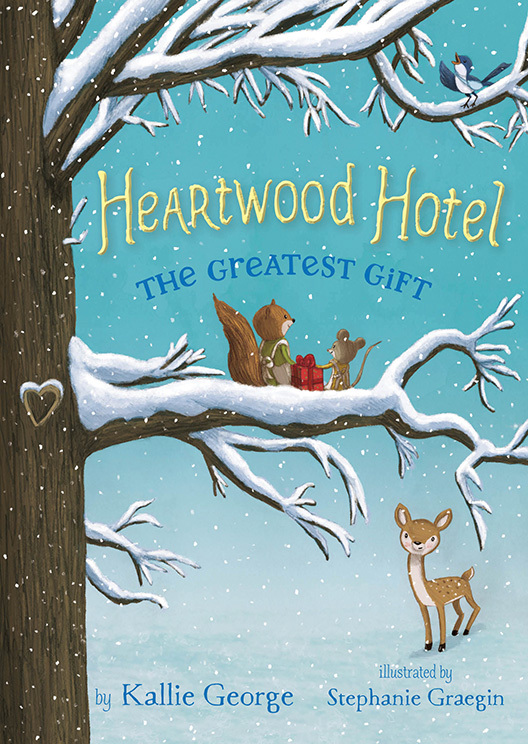 A True Home and The Greatest Gift are the first two novels in the “Heartwood Hotel” chapter book series: sweet, funny tales about a hotel for small forest animals. The Heartwood Hotel series approaches emotions in a charming way, with previous books describing sad experiences as “hurts.” Aimed at readers in 2nd-5th grade, the series provides a great role model for dealing with strong feelings in thoughtful and rational ways. Despite being stories about animals, the series helps kids deal with their uniquely human feelings. Stephanie Graegin also returns to illustrate this third book, providing pencil drawings to help underscore key moments in the story and inspiring kids’ imaginations with this cuddly world. Her work has a quality that reminds me of E. H. Shepard’s drawings for A.A. Milne’s Winnie the Pooh series. While the book is at a reading level perfect for elementary school kids, the illustrations also make it easily accessible for parents to read to younger kids. The chapters are short, allowing kids to digest them at a pace they’re comfortable with. I was already a fan of the Heartwood Hotel series and really enjoyed revisiting this world a third time in Heartwood Hotel: Better Together. This is a delightful and charming series for our youngest elementary students. Advanced readers in Kindergarten - second grade will love reading these books on their own. They are also great read alouds for the teachers and parents to share with their children. This series takes us through a year in the life of Mona the mouse who finds safety and then a new job as a maid in a large tree which is a Hotel for the small woodland creatures. She saves the day in each of the the three books I read. In the fall she makes friends with a bear who helps scare away the wolves. In the winter she discovers who is stealing their food supply and in the spring story she deals with an invasion of owls. The summer book isn't out until July. However, it looks like a wedding and a new guest who might be related to Mona are featured in the story. Heartwood Hotel is such a cute series, and this first book was such a delight. Mona is such a sweet little heroine who starts out homeless and then stumbles open a beautiful hotel in the forest. I wanted to cuddle Mona throughout the story because she is so kind, but is full of determination. She’s a great role model character for younger readers. Each character is so charming, though! I LOVED bossy Tilly, though she somewhat reminded me of my own mother. This first book is just so comfortable, warm and cozy. While there is some danger in the story, it’s nothing too frighting, but it teaches children about finding strength in unlikely situations and how friendship can help solve bigger problems. I also want to praise the illustrations by Stephanie Graegin, which I feel accompany the story so beautifully. I loved having the pictures side-by-side with the text, and I can only imagine how beautiful the artwork looks in the finished edition. This first book is so charming, and it’s definitely one I will be recommending to younger readers when the opportunity arises. Mona Mouse has been through a lot in the first two titles of the Heartwood Hotel series. She's found a new home and friends, helped save the hotel from disaster, and solved exciting mysteries. But now she and the entire hotel are facing a brand-new challenge: Mr. Heartwood is taking a vacation! Graegin's art is as cozy and adorable as ever, with delicate drawings of anxious robin parents and their egg, arguing frog and raccoon bands, and the squabbling fireflies and bees. There aren't many of this type of cozy story anymore, but I have a ready audience for them at my library. There are no flashy magic spells, exciting acts of courage, or sudden revelations, but Mona's quiet little world is very appealing to readers who like cozy, comforting stories. Her daily trials and tribulations as she struggles to fit into her small world, as well as the adorable miniature art pieces that fill the book, are relatable to many of my small patrons. They are a little challenging for beginning chapter readers who aren't yet fluent, but dearly loved by younger readers with a high degree of fluency and vocabulary who aren't yet ready for more mature middle grade titles. Verdict: I have several readers eagerly awaiting the latest in this series and I strongly recommend it as an addition to any library collection that is trying to meet the needs of this community of readers. This is the third episode in a darling series set in the Heartwood Hotel, a lovely woodland resort nestled in an enormous tree and catering to birds and insects, squirrels and skunks, voles and porcupines.... Just the right mix of imaginative, miniature worlds and zesty adventure make this series perfect for reading aloud to 5 & 6 year olds, handing to an advanced-but-young reader, or enjoyed in the hammock by kids who prefer their fiction more charming than spine-tingling. Heartwood Hotel, by Kallie George, and beautifully illustrated by Stephanie Graegin, is one of my favorite early chapter book series about a tiny mouse, named Mona, and her dwelling. There have been three books published so far and each of the stories are richly told and full of adventure and learning about friendship. Each of these books would be wonderful to read out loud. 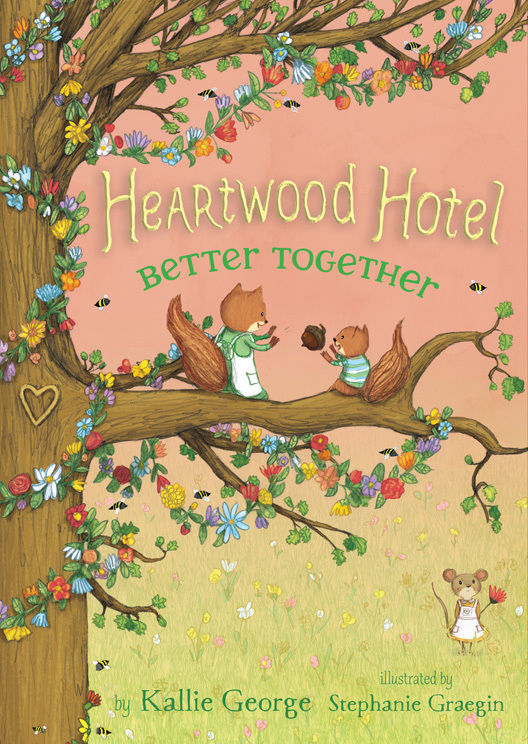 Author Kallie George has written another enchanting book [Better Together] in the Heartwood Hotel series that will delight young readers. The characters are fully-formed and as believable as animal characters can be. The charming illustrations by Stephanie Graegin support the story perfectly. Each book in this series easily stands on its own, but they, as a group, will keep young readers reading for days on end.